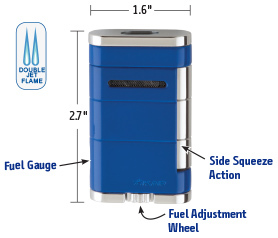 The second largest of the Allume family, Xikar Allume double flame lighter delivers all of the performance you need, but still retains a sleek, stylish appearance. It’s perfect to take on the go, and at just 2.7" tall and 1.6" wide the compact size makes it so easy to just slip into your pocket or bag. Get reliability, durability, and strength you can count on. A fuel gauge window makes running out of fuel mid-day a thing of the past. An over sized adjustment wheel on the base of the lighter turns with ease to where you prefer you flame height to be and with all the color options there is an Allume for everyone.